First, some short intro! 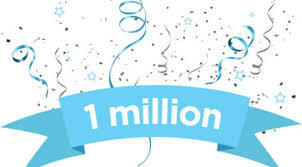 :D My blog views has finally reached ONE MILLION!!! Now if I get a dollar for a view. Phew! None the less, I am so happy with this view count- why? 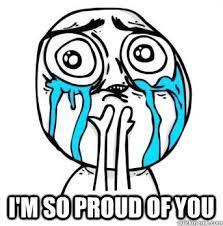 Because it means I helped quite many developers to create their apps (hopefully). And those apps will benefit mankind. Even if it's a fart app, hey, it cheers up people and that is good. What does Reusable Views mean? It is basically a concept/method to display big amount of data in a scrollable area. 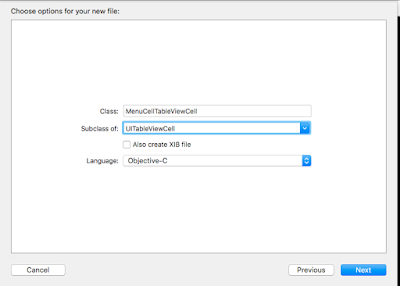 In case of TableView, the amount of cells being created by TableView is only a small quantity that is enough to fit the visible area of TableView. 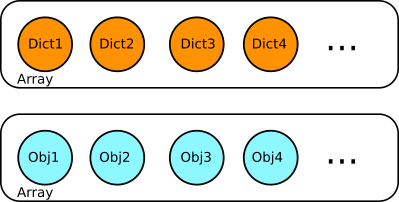 at the top is moved to the bottom and its content is updated according to the datasource (code in cellForRow delegate). This is how Reusable Views work. 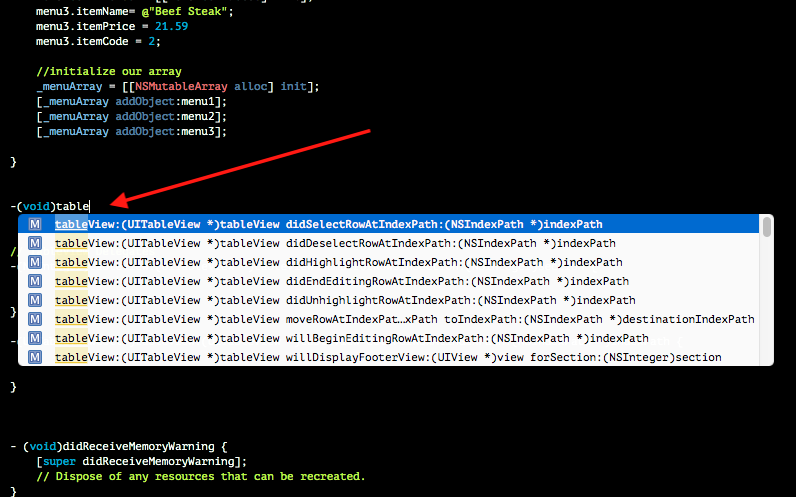 And it is same thing with CollectionView or other objects or custom libraries with Reusable things. So no matter how much data you have, the amount of cells that exist in memory is only 31, at least. Now that you understand this concept, you can code more efficiently and be able to code safely around it. Before we start to write code for our TableView example, we need to understand another concept that is MVC which means Model-View-Controller. We need to write code that comply with this concept and to do this we have to keep things separate. In case of TableView, our Model is our dataSource. 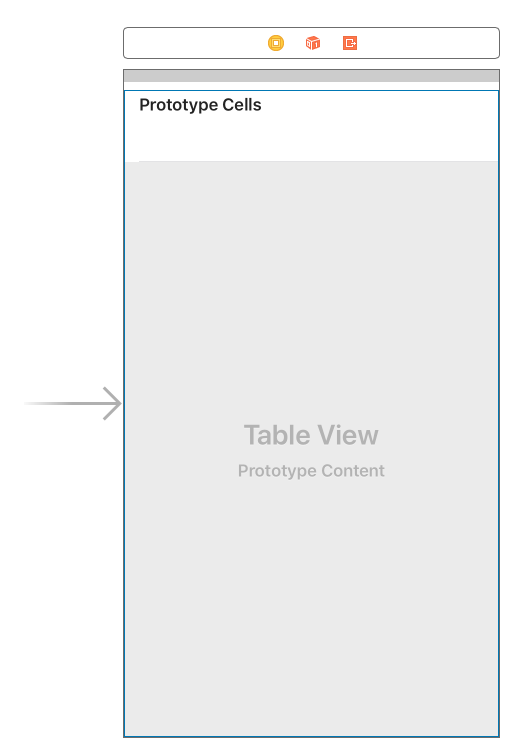 Our View is the TableView object in storyboard obviously. And our Controller is all the delegates functions. Our job is to create our Model that complies to our intention of the View behaviour, and connect Model and View with Controller. In normal English, we need to create our datasource (ie NSArray/NSMutableArray) that has all the necessary properties of the things in our cell and pass it to our delegates. Lets make a tableview that lists down a menu for a restaurant with details of the dish in each rows. Such UI is typical in many applications. How do we go about in designing this feature? We need to create a custom object to work with. Our datasource will be an array containing these objects. So we need to decide what is the contents of our cell item. You can use dictionaries but trust me, objects is the way to go. Objects make coding a lot simpler and cleaner. 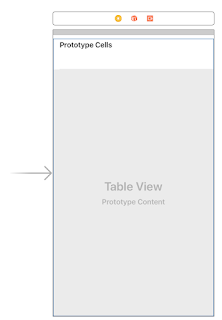 First, drag and drop a UITableView on your empty ViewController. Set the constraints. I leave it up to you how big you want the tableview to be. For me, I just size it up to fill the entire view. 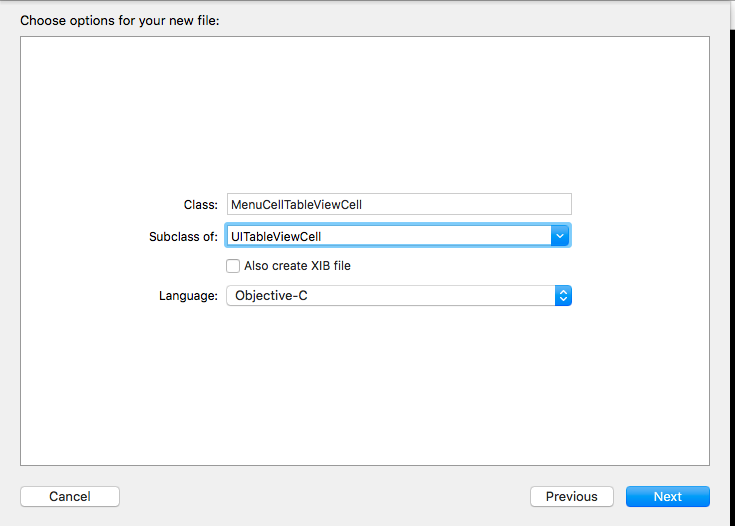 And then I drag the UITableViewCell object into the tableview. You should have something like the following. Next, we need to link the cell to our viewController. If your table contents are simple, like a single text for each cell, you do not need to customize the cell class and you can skip the next step and just use the default cell style class like Basic, Left Detail, Right Detail or Subtitle. Now goto Storyboard and click on the tableview cell, and in the Identity Inspector, in Class textfield, key in the name of your custom cell class that you created above. In this case, MenuTableViewCell. This is a crucial step and if you miss it (many noobs do miss it, including me :D), you won't be able to connect the IBOutlet to the class header. //  Created by Emir Fithri on 03/11/2017. //  Copyright © 2017 geneCode. All rights reserved. Next, return to storyboard and click on the TableView cell and at the Attributes Inspector key in the Identifier of your custom cell. This is very important. For this example, I named it simply menuCellID. The ID is used by the TableView to distinguish if your table has multiple type of cells styles. Leave MenuTableViewCell.m as it is. Our Model is a collection of Objects in NSMutableArray. You could use NSDictionary as objects to store in the array, but custom objects will make coding a whole lot easier and cleaner. Finally lets create the menu objects and fill them into the menuArray. We can do this in viewDidLoad. Remember to #import "MenuItem.h" in the viewController's header so we can use the class. I already covered about class methods and functions in previous tutorial: Basic of XCode Methods & Functions in Objective C. Do read it if you want to know more. And finally, of course, we have to add all our actual data (menu images, and icons). You can add them in the Asset folder. With that, we have completed setting up the "MODEL" part. This is how a class implements a protocol for other class to adopt and use. Get it? The above picture shows how to connect the dataSource of the TableView to the ViewController. Repeat this process for "delegate" underneath it. Then connect the TableView's IBOutlet (New Referencing Outlet) to the ViewController's header. This basically tells the iOS where it can find the delegate functions and the data for this tableView (which is in ViewController). The first delegate is to set our cell height. Eventhough we have manually changed the cell size in Storyboard, the tableView will still need to look for this delegate to set the height, otherwise it will use the default size. This is weird behaviour I know. It could probably be a bug, or a feature I am not sure. :D So lets add code to return the cell height. Next, we need to tell the TableView how much data we are going to display. As you have added 8 objects to menuArray, we therefore can return this number to the numberOfRowsInSection delegate. How to do it? Simple, just use the count method of the array. Important: You should NEVER do calculations in this method. Because it can cause crashes in your app especially when the content of the array you use in cellForRow method does not match with the number you return here. If you want to filter the array, do it outside of delegate functions, load the filtered objects into another array, and return that array's count instead. And when you run the app, you will see it works flawlessly! And that's how you use any Reusables. 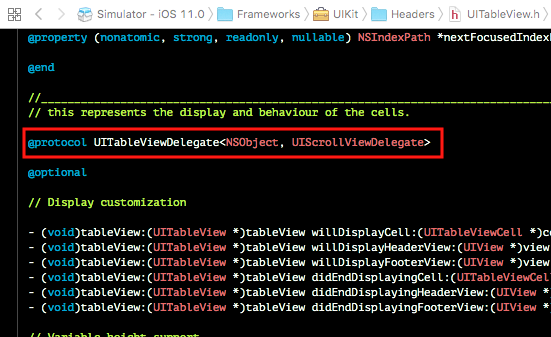 For your own benefit, you can try to apply the same steps to UICollectionView. Try it! That's all folks! Any questions? Shoot in the comment section. I may be late to reply tho but I'll reply when I can! More Contribution to XCode Community!